Codeta Casino was recently launched in early 2016. It’s a unique online casino platform that provides a unique experience when compared to the competition. The casino is operated by EveryMatrix, which has been a strong figure in the gaming industry since 2008. They’re licensed in Malta and accept players from a variety of different countries. This online service puts a focus on delivering a realistic casino experience. Other web-based casinos offer a variety of different games, throwing hundreds of slots games at players to keep them busy and betting. With Codeta Casino, live table games are the main focus. The company strives to create an authentic playing experience, connecting players with real life dealers. They also help players build valuable gaming skills that they can take to other venues. The casino has created a number of video tutorials that are designed to help players succeed with live table games. The name comes from the French phrase “Cout d’État.” The team was inspired by the phrase to create their unique name because of their opposite approach to gaming. Essentially, they’re attempting to take the industry by storm and become a top casino. With their focus on live games and intimate playing environment, the casino is well on their way. The online platform for Codeta Casino is designed to be modern and sleek. Instead of going with flashy graphics that grab attention, the casino has gone with a sophisticated vibe that’s reminiscent of luxury casinos on the Las Vegas strip. The landing page is covered in black and deep muted tones of gray. The white text pops against the dark background and creates a contemporary look. In terms of layout, Codeta is all about class and minimalism. The landing page is filled with links to the various games offered in the casino. These links are displayed as images. These images aren’t the average basic clipart. The team behind the website development took every detail into account, including the graphics. These images are edgy and sophisticated. They go with the overall feeling of the website and perfectly depict the game they’re meant to represent. A bar on the top of the page provides easy navigation for members. It has login information, a search bar to find popular games, and a quick customer support button. Towards the bottom of the page, members can find detailed information about the casino. Links to separate sections of the website are also present to provide information about terms, conditions, and much more. Because Codeta Casino is new, the bonuses and promotions that they’re offering new members are important. These bonuses are what gets new players to the website. The casino has gone with a rather unconventional approach to bonuses. They don’t offer any type of no deposit bonus. Instead, they provide new members with a choice between two different ways to increase their winnings and make a free bet. The second option that new members have is to simply take the 10% top-up or cashback bonus. Choosing this forgoes the welcome match bonus. However, it extends the top-up or cashback period to 4 weeks. The bonus is rewarded on every 8th day for the first 28 days of the account being open. It’s a great option for those that want to get free money but don’t think the reload welcome bonus is for them. It forces players to really learn the game and win big. While other casinos go straight for a no deposit bonus, Codeta Casino thought outside the box to reward players while also motivating them to succeed. Modern casinos are expected to have some form of mobile play. Today’s gamers are constantly on the go and most own a mobile device. Players can’t spend all their time on a desktop, so many casinos have a mobile version of their website for those that want to play wherever life may take them. The mobile version of Codeta Casino is still relatively new. It’s not as full-featured as the computer website. However, the games and features it does have are expertly optimized for the platform. There’s no downloadable application. Games are played on the mobile browser to ensure compatibility across a range of tablets and smartphones. Codeta Casino offers video slots, dice games, and live table games on their mobile platform. Most casinos only offer slots, as they’re the easiest to modify for flash or HTML5. However, Codeta Casino is all about live table games. They’ve managed to connect players on the go with live dealers regardless of where they are in the world. All players need is a modern mobile device, an effective web browser, and a stable internet connection to take advantage of what the casino has to offer on the go. Codeta Casino is all about quality over quantity. Their selection of games, while large, is comprised of high-quality options from leading developers in the industry. There’s no substandard game in the catalog. Every option is expertly made with stunning graphics and sound effects. The casino has games from developers like Net Entertainment, Microgaming, Play’n GO, and more. With the support of these game makers, members can rest assured that their gaming experience will be enjoyable no matter what. The online casino has a number of different slot machine options. They contain unique themes with in-depth stories that players will care about. Their animations and graphics match the theme to complete the immersive playing experience. Players will find video slots that cover western, fairytale, and mystery themes. The casino even has a large selection of licensed games including South Park, Scarface, Bridesmaids, and more. Players that enjoy table games will get their fix at Codeta Casino. They offer a plethora of different types of popular table games. Whether it’s BlackJack or Roulette, this online casino has it all. Furthermore, they have different versions of the same game. Slight differences in gameplay will mix up the gaming experience and provide a breath of fresh air. Codeta Casino is equipped to handle a bevy of live games. This is where the casino excels. They use advanced technology to connect gamers with real-life dealers in a studio. It helps to recreate the live casino experience. It takes the predictability out of online games and introduces subtle nuances that make the experience unique. Gamers today expect a variety of payment methods to perform transactions. Various options ensure that a wide range of players can partake in the fun. It also speeds up the process and avoids long processing times. This makes it easy for gamers to jump in on the action as fast as possible. Codeta Casino understands this and accepts some of the most popular methods for deposits and withdrawals. These include Visa, NETeller, Zimpler, Skrill, Paysafecard, Trustly, and Euteller. Because the company behind the casino has been in operation for quite some time, new members can rest assured that their transactions will be handled professionally. The company takes precautions to keep financial information safely guarded. Transactions are performed swiftly and efficiently so that members can start playing. Codeta Casino has an experienced team of customer support specialists ready to help members with any issues that may arise. The casino is focused on providing a high-quality gaming experience, and that includes top-notch service. They can help with a variety of different issues pertaining to the casino and service. This includes account information, technical problems, and bonus concerns. Their team is available every day of the week from 10am to midnight. Support specialists can be contacted a number of different ways. This makes it easy for members to get help on their own terms. The team can be reached via email, phone, or live chat. Links to this information are found at the bottom and top of the website landing page. Live chat is the quickest way to get help. Agents will often answer questions in 60 seconds or less. With emails, members can expect a response within two hours, as long as the email was sent within business hours. This brand new casino is designed for the player that wants a quality experience that rivals physical casino venues. While Codeta Casino puts their focus on live table games, they have options for any type of game out there. Whether it’s an interactive video slot game or a classic game of French Roulette, why not play it at Codeta Casino? Their exceptional service, large selection of games from trusted developers, and a website that exudes sophistication all contribute to the casino’s success. 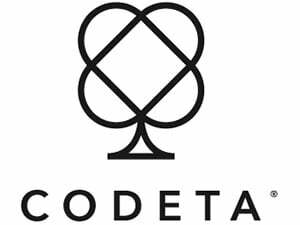 At the rate they’re going, Codeta Casino is sure to be a leading brand in the industry.